Delivered via Muddy’s classic ‘Mannish Boy’ – featured in countless songs – it’s a fitting intro and immediately made a cinema full of London blues dancers grin from ear to ear. This cinematic offering from Scott Rosenbaum [Related article: Sidemen | A Road to Glory — interview with Scott Rosenbaum] is a fine tribute to the struggle, legacy, and redemption of some of music’s most overlooked heroes: Pinetop Perkins on keys for Muddy Waters, Willie ‘Big Eyes’ Smith on drums also for Muddy, and Hubert Sumlin on guitar for Howlin’ Wolf. The first is of the sidemen who helped create the sound that defined a generation but whose names live in obscurity. The second story is that of Chicago Blues itself …and its baby that became known as Rock ‘n Roll. The film uses the narratives of a few key musicians to portray the heart and the soul and especially the torture of The Blues. From share-cropping in Mississippi to new beginnings in Chicago, these men epitomised the classic narrative of ‘the Bluesman’. They defined the American sound, fell into obscurity even though rock ‘n roll flourished, and then were returned to the limelight via the British music scene. Famous musicians like Johnny Winter, Bonnie Raitt [Related article: Visions of the Blues], Gregg Allman, and Joe Perry remind us that there is no rock without blues and that performers like Sumlin, Perkins, and Smith are their icons, legends, and heroes. Telling us very little of these men’s early careers in the 50s, the film features the British Blues movement more than any other subject. Indeed, the 60s and 70s are the years when these sidemen made their mark, when more modern sound equipment captured their massive sound, and when the Baby Boomers caught on. 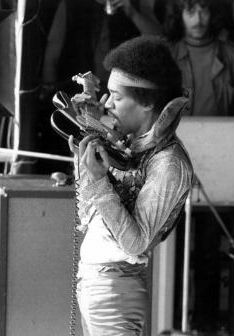 First, Hubert Sumlin recalls watching the crowd part like the Red Sea at a gig in Liverpool, as an unknown, bandana-wearing Jimi Hendrix strode to the stage. He went right up to Howlin’ Wolf, asked him if he could play his guitar (the chutzpah! ), and promptly made it sing – with his teeth! Howlin’ Wolf’s ‘Killing Floor’ featuring Sumlin’s catchy riff would become one of Jimi’s early trademarks. YouTube tells me that Hendrix’s live rendition with the band named Cream supposedly left Eric Clapton (a member of Cream and future blues icon in his own right) so shaken he had to leave the stage to have a cigarette. Without Sumlin though, there would have been no Hendrix. A second anecdote revolves around 1971s seminal The London Howlin’ Wolf Sessions, one of the first ‘super session’ albums which featured current musicians like Clapton and the Rolling Stones’ Bill Wyman and Charlie Watts alongside the master; Howlin’ Wolf himself. Sadly, it took Clapton to intervene and convince Chess Records to pay for Sumlin to fly over and join the sessions too. It seems a number of London’s best musicians filtered in-and-out of the studio over these famous five days, but it almost didn’t happen. Clapton explains the chatter that precedes ‘Lil’ Red Rooster’ in which he asks Wolf to show them the (rather simple) changes and encourages him to play along. Wolf had seemed uneasy and needed a bit of flattery. Hence, why it kicked off the film. These stories left me wanting more. Other than a quip or two about knowing when to play and when not to, and how and when to swing, very little is said about the technique these artists actually used to create their sound. What exactly made them so great? How did Sumlin go from the didley bow and coke-bottle slide to defining the electric guitar? Despite seeming to find success, Sumlin, Perkins, and Smith struggled in their lives and in their careers. Sidemen intersperses their individual stories throughout the film, darting between their bios and talking about the glory days. Although feeling a bit structureless at times, this back-and-forth not only keeps up the pace and tone but also provides constant contrast. Beautifully lit interviews with the main men, highlighting every line and fold, capture the light and sorrow in their eyes. Their escape to Chicago and careers in music are bittersweet. Sadly, despite running only 75 minutes, Sidemen tells us virtually nothing of these players’ actual lives on the road. There is not so much as one anecdote in which Muddy or Wolf fought with their band members or showed them gratitude. My mind filled in the gaps. The road often meant a new city every night, your fate in the hands of your bandleader, and your ears withstanding the thunderous applause at the names Howlin’ Wolf and Muddy Waters. I imagined arguments over pay, credit, and direction; fistfights and loving embraces. Wikipedia tells me gigs were so scarce, Smith briefly left Muddy’s band in the mid-60s to drive a cab. This is rare footage of the Muddy Waters Blues Band from the 60s and 70s. See if you can spot Pinetop on piano or Willie on drums. You’ll certainly be able to hear them. That is the most criticism we hear. Yet, at the time of his death, 97-year-old Perkins was living in low-income housing and still working once or twice a week. Likewise, after playing with his makeshift father on-and-off for three decades, Hubert Sumlin died in poverty. Keith Richards and Mick Jagger paid his funeral expenses. Smith fared better after 25 years with Muddy and another besides, but was also still working in his final year. All three sidemen had even more trouble after Howlin’ Wolf and Muddy Waters died in 1976 and 1983 respectively. To the industry, Hubert said, it was like so: if ‘Wolf dead, you dead’. At the peak of their talent, but with new wave and synth-pop ruling the airwaves, Sumlin, Perkins, and Smith scraped to find work. They worked ’til their death really, although footage of them playing effortlessly together from 2008 to 2011 as part of the The Perfect Age of Rock ‘n’ Roll suggests this wasn’t just for dosh. Since Perkins was recognised on two prior occasions, including a Lifetime Achievement Award (although not mentioned in the film), this chapter focuses on Willie whose enthusiasm is palpable. He’s virtually jumping off the screen and it is a joy to behold! In this moment, I couldn’t help but recall the stark images of their childhood presented earlier. My mind transported a 12-year-old Willie Smith into the present. He was too poor to buy any instrument but a harmonica – and here he was, triumphant at last. Before he left for Chicago at 17, his world was black. Whites were to be averted, skirted, treated with care. What would it have meant then to stand in front of a white audience, to be recognised by an white body, to be revered by a white crowd? To be not just equal, but revered? To what extent were feelings of validation complicated by feelings of resentment? The role white men played in denying and then handing him recognition is inescapable. When Willie’s son, Kenny ‘Beedy Eyes’ Smith – who also drummed on the album – was asked about the Grammy win, he sighed. It was, “More of a relief… than anything else”, he said. It was a relief to watch Willie and Pinetop get their due; and a release. No blues song is complete without a glimmer of hope. So after an hour of minor chords, I admit a shed a tear at this major one. Hubert, Pinetop, and Willie passed away in 2011 within 8 months of each other. Along with ‘Honeyboy’ Edwards they were the last of the Delta bluesmen. 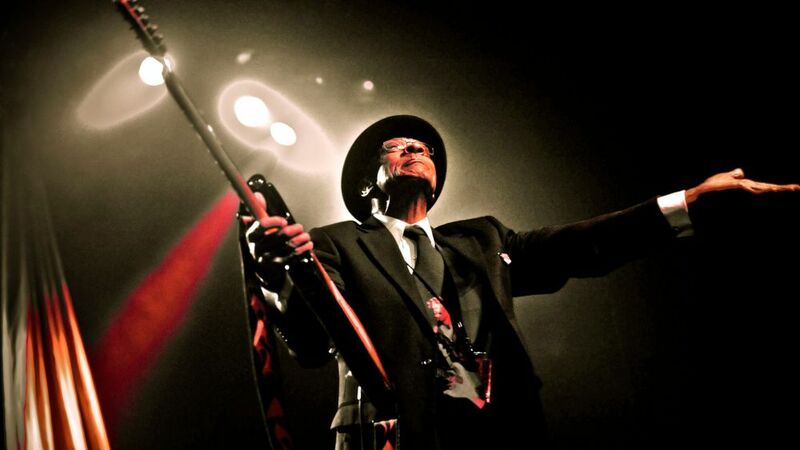 In his later years, Pinetop established the The Pinetop Perkins Foundation which brings teenagers to the plantation of his youth every summer for a Blues masterclass. A few parting scenes of said teens jamming and paying tribute is a fitting way to show that Sumlin, Perkins, and Smith’s legacy lives on. In summary, while being thin on details, Sidemen is big on atmosphere and had us grooving in our seats while feeling part of something special. Stay up to date with all the latest release news of Sidemen here (Official Website). And for more blues docs featuring sidemen, check out Born In The Honey, Standing In The Shadow Of Motown, The Wrecking Crew, and Twenty Feet From Stardom. Many thanks to the author Cara Bennett. Cara was born and raised in Pittsburgh, Pennsylvania but has spent most of her adult life in the UK, now residing in London. She has been partner dancing to the blues since 2010, but has been been listening to it since she was a kid. In between dance festivals across the UK and Europe, Cara occasionally takes the time to teach some young people history and English.